Normally, I ignore Conservative Home, have been banned from their comments at times, and having had the EU Ref link summarily removed from their site, so that we were cast into outer darkness. The blogosphere remains the hunting ground for tribal warriors, and I have neither time nor patience for its petty-mindedness. 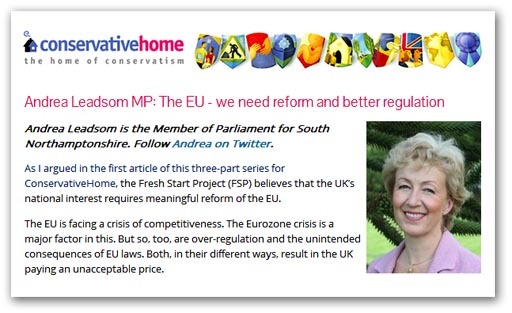 Others, with tougher constitutions, still frequent the site, and I have thus had my attention drawn to this from Andrea Leadsom (above), who is still pushing her mantra of "meaningful reform" of the EU. And there is also this from George Freeman, also of the Fresh Start Group. Actually, having read the pieces, I wonder why I bother - why anyone bothers. Neither are saying anything new, nor anything interesting – there is nothing at all that informs or inspires. We are not getting argument – simply leaden propaganda, repeated again and again, presumably to reinforce the belief systems of the faithful – for no one else will believe it. My answer was given in June 2004, repeated many times, but particularly in January of this year. These are my "barking cats" pieces, to which – in conceptual terms – I can add very little. Leadsom and her ilk – including her Open Europe minders, say we must "reform". I, and many others, say that "meaningful" reform is not possible and will never happen. And those are the positions – fixed, unchanging. There is no debate, nor any possibility of debate. Disagree, and make the mistake of disagreeing too forcefully or too often, as you get "disappeared". The other side do not want to know, any more than we want to hear the repetitions of their arguments. From that, though, does not emerge a counsel of despair – simply a recognition that head-butting gets you nowhere. It seems to me that a better strategy is to introduce new facts and ideas, which by-pass the blockage. Leadsom might want to bleat about "over-regulation" and "negotiating over tedious directives", at EU level. We simply point out that the regulation is at global level and that is where we need to be. On wind turbines, we can rehearse the arguments for and against until the cows come home and the macerated birds fall from the sky. But sell the idea that, if you buy wind, you get diesel, and pay £1 billion for the privilege, and the argument looks very different. Similarly, take the claims of our influence inside the EU, and tell people we can't even argue for our mackerel quotas and again the terrain looks very different. But that is why the opposition wants to control the flow of information. It does so mainly by ignoring new facts – by not discussing them, not debating them, not even recognising them. When, for instance, have you ever heard about Codex on Conservative Home? Thus, we do not speak to the close-minded. It is a waste of time. The likes of Leadsom will go to her grave still arguing for "meaningful reform" of the EU, long after we have left the EU and it has crashed and burned. We can't deal with that. This is the dialogue of the living dead.